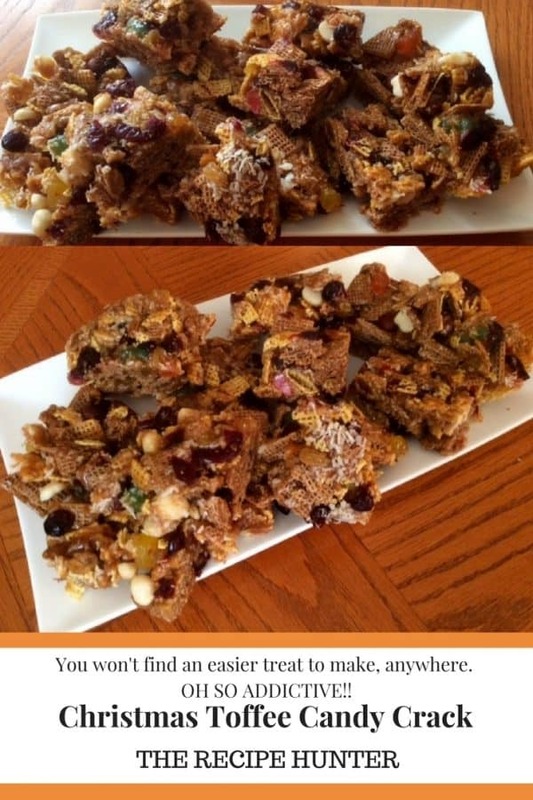 You won’t find an easier treat to make, anywhere. 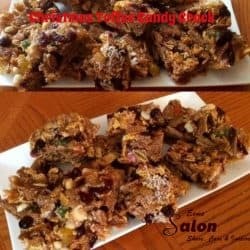 Christmas Toffee Candy Crack – It’s breakfast cereal, nuts, and some more yummy goodies and OH SO ADDICTIVE! I have made this before, but this year I decided to once again change it a bit and added some different goodies to my mixture. I also opted to make the syrup in the microwave. In a large microwave bowl, add all the syrup ingredients. Cook on high for 2 minutes, mix and then cook a further 3 minutes and mix again. At this point, the butter and sugar should be melted. If not, give it a good mix and whisk until all dissolved. Return the bowl to the microwave 2 minutes at a time for a total of 8 minutes. Take out after each 2-minute increment, mix and whisk a little. Cook syrup ingredients to “soft ball” stage. You may need more or even less than the 8 minutes, but it will depend on the strength of your microwave. Toss the dry ingredients in a very large tray with a high rim lined with parchment paper and mix properly. Pour the syrup evenly over the dry mixture and mix thoroughly. Be careful as the syrup will be boiling hot, so use a wooden spoon to mix. Make sure that you have everything nicely covered in that oh so yummy and gooey sticky syrup. Once done, you can press it down with the palm of your hands in the pan and once cold and set (not sticky), break or cut into bite-size chunks. The other option would be to give it a stir from time to time and let it form clumps on its own. You decide what you wish to do. This is perfect for an edible Christmas goodie bag. A nice breakfast recipe, Esme. How can I resist a recipe with the word ‘crack’ in the name? Hilariously delish! Seems like months since I was here Esme, so must ask how the cook book idea is rolling? Gary – Craisins, is dried cranberries or you can use anything else you wish. I used whatever I had available at the time. Must be, although it’s registered as a trademark name to Ocean Spray apparently. Oh sorry. missed to respond on the cook book idea. I have put that on ice over the Christmas period time and will for sure revisit this as I am very much interested to do it. That’s OK, I wasn’t expecting progress this side of Christmas! Be a good project for 2018 though. Hope so, will knock on your door again for help on this one. Thanks, I am so happy to have you on my team on this project, looking forward to it. I’m hopeless at this stuff. I burn EVERYTHING. But this looks so good I might give it a shot anyway! These look and sound delightful. Didn’t know you could make syrup in the microwave! Thanks – shows how much I know. Will have to find similar cereals to use here in the UK! Thank you – will let you know how it goes! Please do, this is a versatile recipe – you use what you have available and ♥, not a real recipe as I change it every time I make it. Sounds delicious. I wonder if it could be made with a lower sugar content… and it probably could. But one or two of these little treats wouldn’t do anybody any harm – as long as they could stick at 2! Yes, its a sugar bomb but one of two *small blocks* would do no harm, as long as you can stick to one or two. Put it in gift baggies (2) for each and you’re set. love that part of this can be done in the microwave, so easy and quick! This recipe looks quick and easy which is great for this busy time of year. Thanks for sharing with us at #BloggersPitStop. It’s an absolute delight to do so. Sharing is Caring and I love quick and easy recipes.